HASC is a progressive American organization advancing seva (community social responsibility), interfaith collaboration, pluralism, social justice and sustainable civic engagement to ignite grassroots social change and build healthy communities while strengthening our places of worship. It seeks to bridge the gap between US govt and Hindu/Dharmic people. HASC was developed with the guidance of the White House Office of Faith Based and Neighborhood Partnerships and is a service partner with CNCS. Yoga has become a universal language of spiritual exercise in the United States, crossing many lines of religions and cultures. Everyday millions of people practice yoga to improve their health and overall well-being. That’s why we’re encouraging everyone to take part in the Million PALA Challenge (MPC). The MPC is offered by the President’s Challenge, a program of the President’s Council on Fitness, Sports and Nutrition. Developed in partnership with the First Lady Michelle Obama’s “Let’s Move!” initiative, the MPC has set a goal to get 1 million Americans to earn the Presidential Active Lifestyle Award (PALA). Show your support for yoga and answer the challenge! To achieve PALA, your goal is to be active at least 5 days a week for 6 weeks. Youth (6-17 years) should get moving for at least 60 minutes per day, and adults (18 years or older) should be active for 30 minutes per day. The official kick off date for the Yoga PALA Challenge is July 29th but you can get a head start and begin tracking your activity now! Remember that any type of physical activity counts towards earning a PALA certificate, so record your yoga activity as well as taking a walk, going for a swim, or playing a sport. Combine your PALA with nutritious meals for a healthy lifestyle! The Million PALA Challenge concludes on September 14, 2011 and in order to be counted you must begin by August 1. Don't delay and start tracking towards your PALA today! 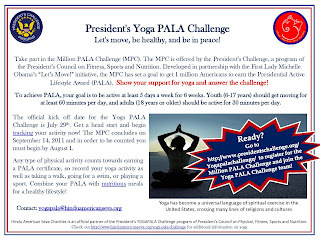 Visit http://www.presidentschallenge.org/yogapalachallenge/ to get started. And..... If you can, join us as we collectively launch Yoga PALA Challenge in Washington D.C. Check out our website for location and additional information on yoga. Let's move, be healthy, and be in peace!!!!! Good Cause, Outstanding and Great Team work.